I'm trying to find the dictionary file for Google Chrome on OS X - I'd like to remove certain words from the dictionary so that I don't use them when writing email (such as 'foolish' for example). In Firefox, this was a simply a matter of editing the dictionary file, but I'm not sure were I would find it in Chrome? It doesn't appear that there is a user-editable file with the default dictionary in it. I just looked through the .app folder and saw nothing like a dictionary. Also, ~/Library/Application\ Support/Google/Chrome/Dictionaries/ doesn't list any dictionaries. If you are using a non-default profile, instead of the directory named Default, check for a directory named Profile n where n is a number starting from 1. If the spell-checker keeps underlining a word that you often use, right-click the word and select Add to dictionary. Windows, Chrome OS, and Linux only: Words that you choose to add to the dictionary are added to your "Custom spelling dictionary". In the open text field, type the new word that you want to add. To remove a word that you've previously added, hover over the word and click X. Source: https://support.google.com/chrome/answer/95604?hl=en Checked: October 4, 2014. Rechecked May 26, 2015. It's just a text file, with LF-only line terminations, and a list of words in case-sensitive alphabetical order, one per line. There's a checksum at the end, with no LF at the end of that line. There's also a backup version, in the same folder, named "Custom Dictionary.txt.backup". According to this https://chromiumcodereview.appspot.com/11414282 if the checksum fails to match in the regular version of the Custom Dictionary, and there's a backup version with a correct checksum, Chrome will silently discard the regular version and revert to the backup version. Location of Custom Dictionary.txt on MAC has changed yet again. This is due to the fact that Chrome now supports multiple user profiles. Profile 1 will change based on which account is used. Not the answer you're looking for? Browse other questions tagged google-chrome dictionary or ask your own question. Where is Chrome “App dictionaries” path? Is there a Google Bookmarks plugin for Chrome? Is there a Google Chrome extension that acts like Firefox's keyword quicksearch bookmarks? Google analytics chrome campaign plugin? How Can I Edit Google Chrome's 'History Provider Cache' File? 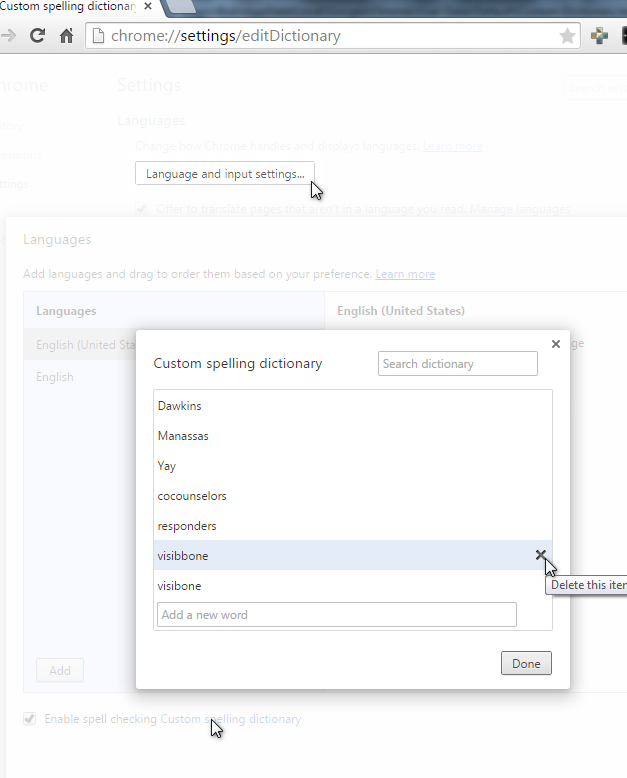 Libre Office: See the dictionary words? Chrome User Data: where, aside from Library, might it be? Where can I download an older version of Google Chrome?